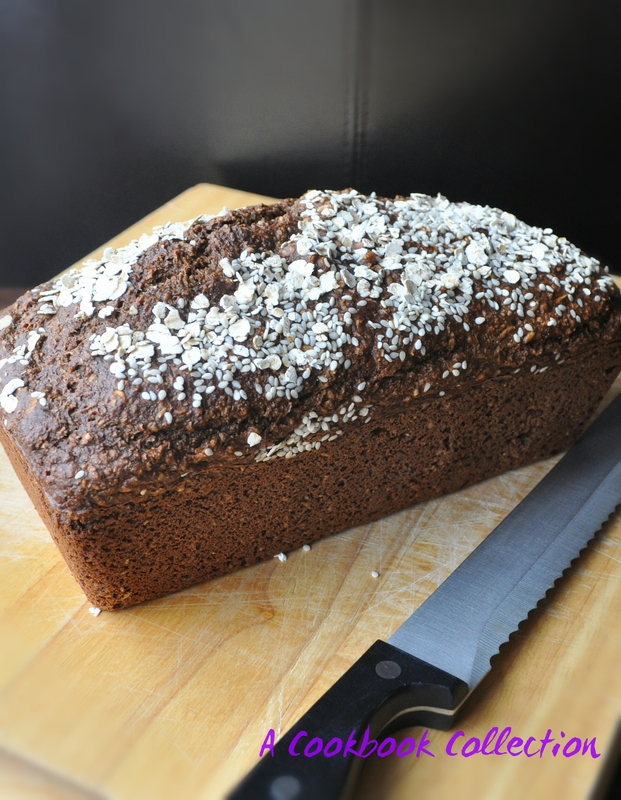 This week is National Bread Week and the perfect time to share this recipe for Guinness Brown Bread. The aim of National Bread Week is to show how bread, real bread, can be part of a healthy low fat diet. We’re not talking about a rubbery sliced pan here. Bread gets a lot of bad press, particularly from ‘lifestyle gurus’. This page aims to dispel some of the myths surrounding bread. Everything in moderation and all that…. I have actually come up with this recipe by adapting the brown bread recipe from Kevin Dundon on that website. I already have a trusty recipe for Brown Soda Bread but I like a richer almost malty brown bread myself. It is a very easy recipe, there is no faffing about with yeast or waiting for dough to rise. 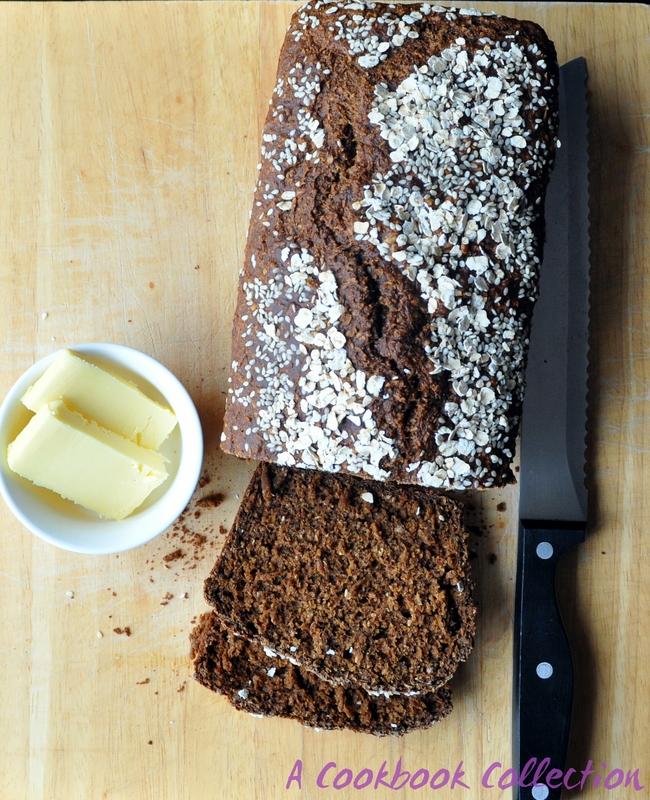 The addition of Guinness and black treacle adds a rich sweetness to the bread and make it very moist. It is very adaptable, feel free to leave out the treacle or the porridge oats or to add seeds to the dough. Occasionally I use more Guinness and reduce the amount of buttermilk, the important thing is to keep the liquid to 500ml in total. It is worth making for the smell alone! The bread keeps for about 4 days and would freeze well. Preheat oven to 170c/ 150c fan/gas mark 3. Grease a 2lb/900g loaf tin with plenty of butter. Sieve the plain flour, bread soda and salt into a large bowl. Add in the wholemeal flour and oats and mix well together. Make a well in the middle of the dry ingredients and add the Guinness, buttermilk, egg and treacle. Beat it all together well until completely combined. Pour the mix into the buttered loaf tin. Spread it out evenly with a spatula and sprinkle some seeds and extra porridge oats on top if you like. Remove the bread from the tin and put it back into the oven to bake for another 15 minutes. Cool the bread completely on a wire rack before cutting it. *Edited to add, if you are having difficulty keeping the crust hard I find allowing it to cool in the oven with the door slightly open will keep it firmer for an extra couple of days. Excellent looking bread. Very nice indeed. Would this work in a bread making machine? I guess it would? Thanks for sharing. I was searching for some tasteful bread recipes. I’ve never used a bread machine but from what I’ve read of other recipes it should work. It is a very simple recipe though so there is prob no need to use a machine. If you make it I hope you like it! I hope you like it Tara and that it doesn’t disappoint. Gosh, no, be reasonable. 2017 at the earliest. I’ve never been reasonable in my life! ? Do let me know how you get on. Yum that looks fab and am imagining the smell!! Oh wow! Need to try this! I hope you like it Rachel.